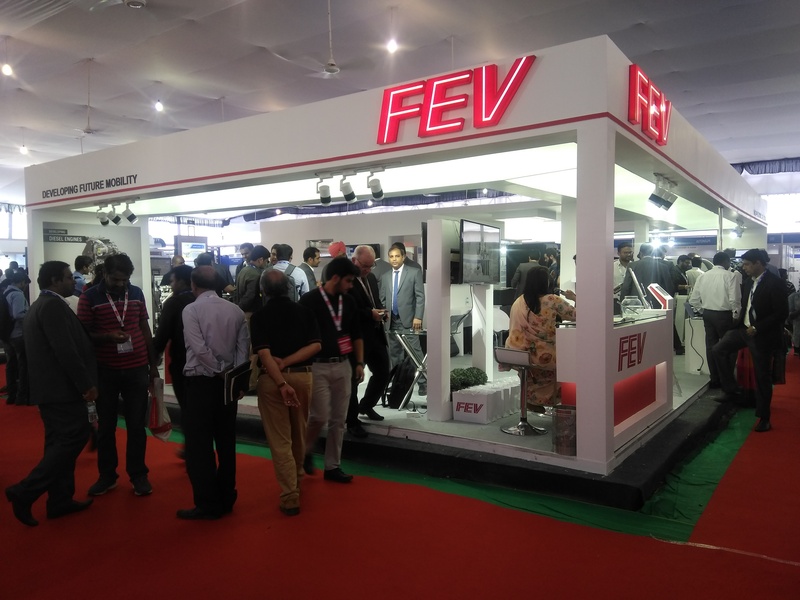 Let us start with FEV, my current employer, I was certainly impressed by the size and the overall layout of the stall, representation of the products and concept models were great, the people explaining in the stalls where the actual engineers who worked on the device/concept which was some things that was missing in other stalls I visited. 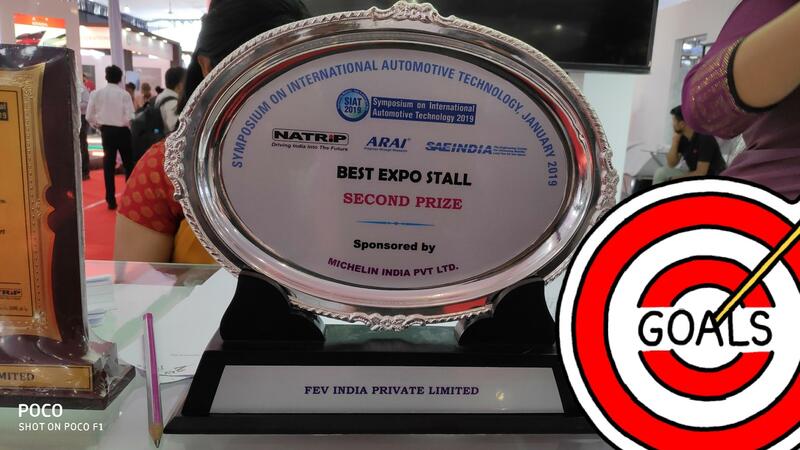 The SIAT committee also felt the same as they awarded FEV as the second best stall. 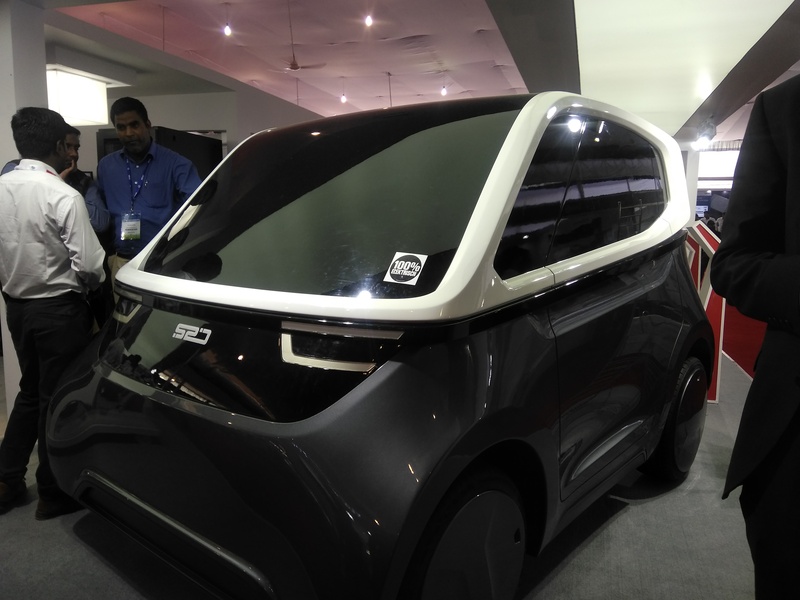 FEV also showed off their autonomous vehicle concept model and shared their plan and capabilities of designing autonomous vehicle. 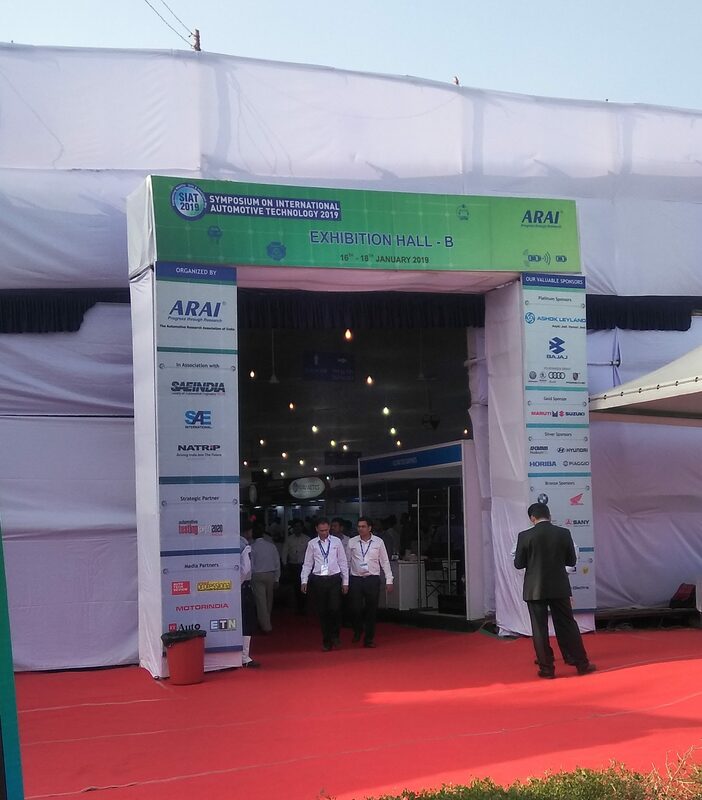 National Instruments had many demos to show off in various aspect of automobile development and testing. One demo I would like to focus on is their HIL (Hardware In Loop) test setup which they showcased. For those who don’t know about HIL testing let me try and explain it in brief; As the name suggest the Hardware In Loop is testing carried out on an actual hardware by providing sensor inputs which are emulated by software and checked if device gives an intended response, to give an example we can consider the demo shown by NI. 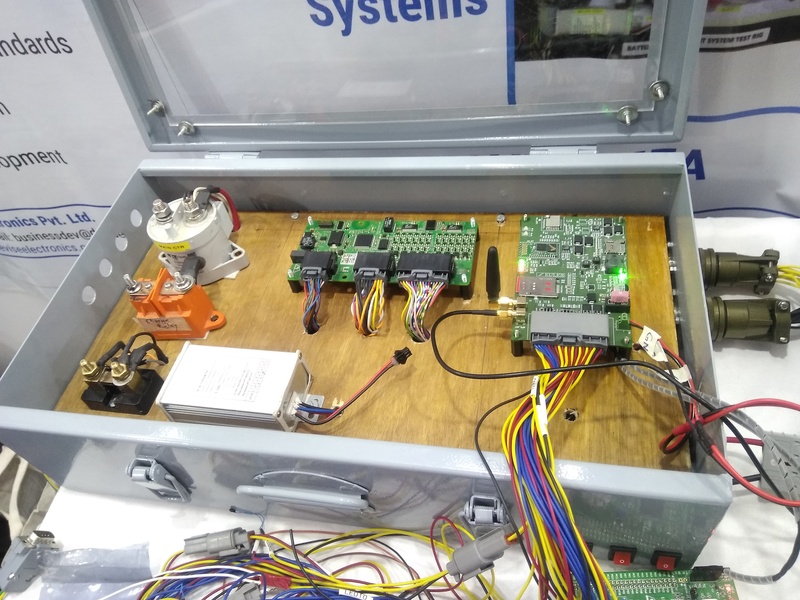 They are testing an engine ECU by providing various sensor inputs from their LabView compatible hardware, these type of tests are very useful as one can go through various test routines which are hard to perform in the real world. 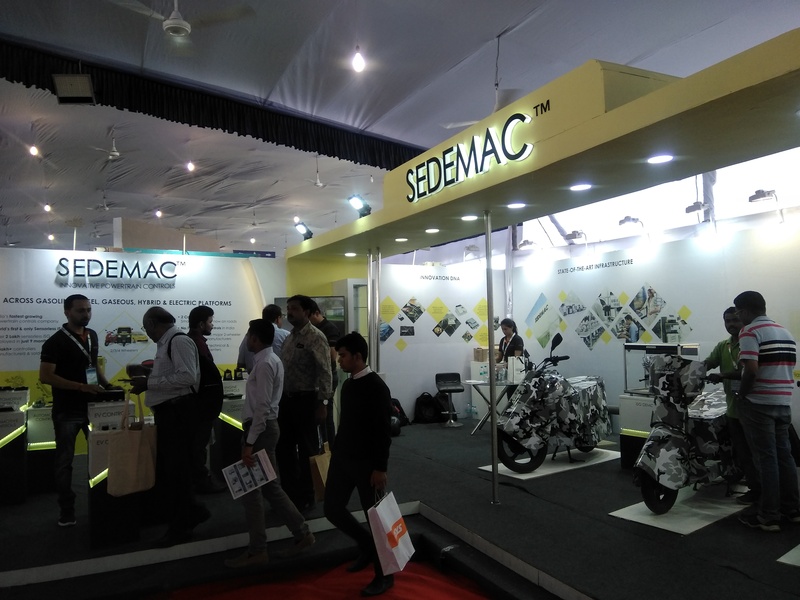 Next, let us talk about SEDEMAC, they too had a lot to show in their booth from various controllers and ECUs. But their main attraction was their Engine ISG demo setup. ISG stands for Integrated Started Generator, their ISG technology eliminates the need for starter motor to start the engine, from what I could understand, the dyno/motor which is needed in an engine to generate power and charge the battery is used to crank the engine during the start operation, this eliminates the need of using a starter motor. This technology not only reduces cost but saves space, it also is used to bring start-stop technology in a two-wheeler. The start-stop technique is widely used in cars to provide more fuel efficiency by switching off the engine when the vehicle is stationary for more than a few seconds and restarting the engine when it is time to go, this full process is carried out without any intervention from the driver. 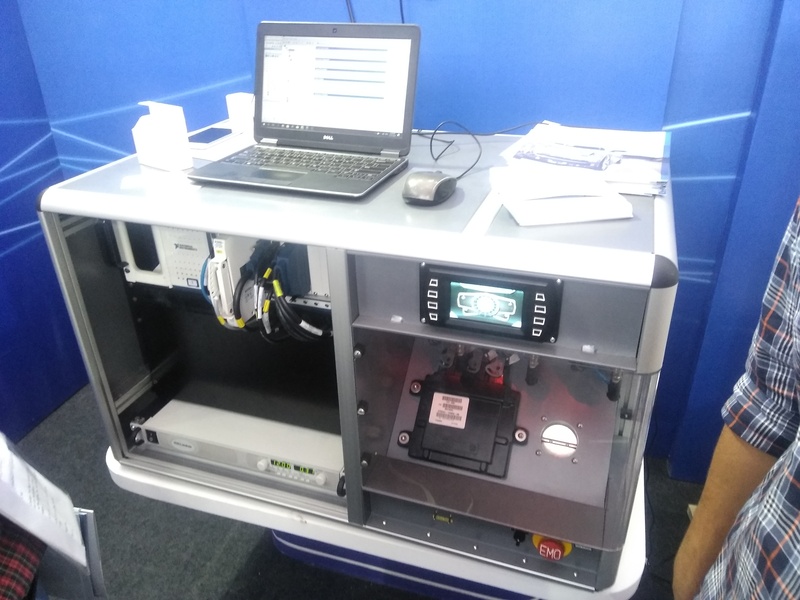 Sedemac has its own ISG ECU to control this operation, I am not sure why didn’t they reprogram the existing ECU and if there was no existing ECU in the vehicle then how are they able to stop the engine. 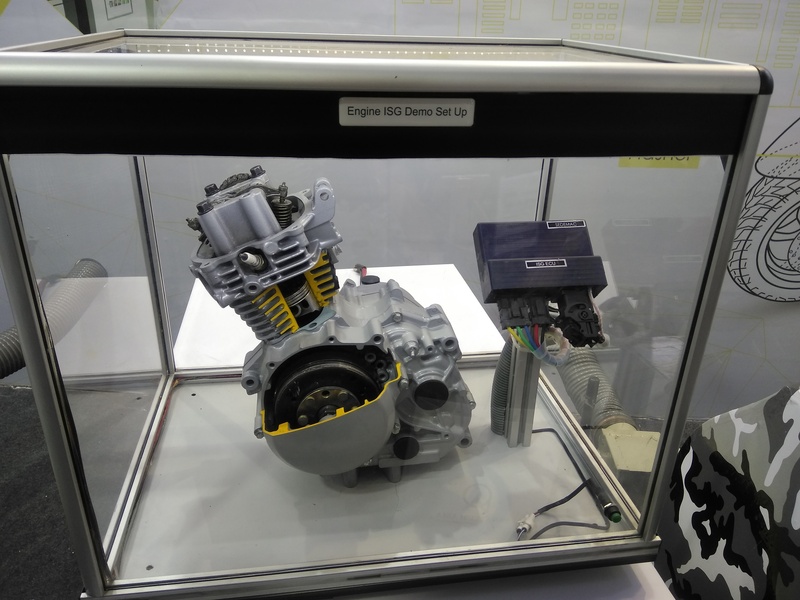 This technology can be added to two-wheelers which are already in the market with minimal changes to the original vehicle and they also had a demo of a few of these modified two-wheelers to showcase. Finally, we are going to talk about one of my favourite stall this year which was from Devise Electronics. As mentioned earlier there were many companies showing their innovative projects which they have completed or are currently working on but one thing I noticed time and time again that most of the companies who’s stand I visited in SIAT are not designing their products in India, many of them have manufacturing in India, testing in India but no design in India (by which I mean electronics design). But companies like Devise Electronics are amongst the few companies who work on developing their own hardware. From what I could understand about the company, they are currently selling Battery Management, Battery Charging solutions developed by the foreign company, meanwhile learning from the market and developing their own solution. The image shown above is a complete battery solution which what they currently are providing. Engineer explaining us their setup also showed a prototype which they have been working on where they have combined the full functionality of the above-shown system into just one small board whose size was just a bit bigger than a modern smartphone. This will certainly reduce the amount of space required for the system but also the cost of the system is reduced. Devise Electronics also provide many other services like R&D services, product development, etc. The most impressive part was that they also provide training on automotive electronics to engineering graduate students as well as experience professionals bridging the knowledge gap which we currently see in the electronics industry. No wonder engineers explaining their demo were knowledgeable and enthusiastic about their product. Hopefully, you enjoyed this brief rundown the few stalls I visited in SIAT 2019 and are motivated to visit SIAT next time around.